Materials: Glass and Stone Mix. Colour:&###xA0;Mother of pearl, clear & frosted brown glass & stone. Suitable for bathroom and kitchen walls and ideal for making splashbacks, borders and feature walls. 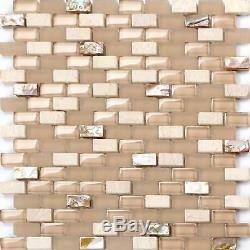 The mosaics tile pieces are glued onto a flexible backing making them easy to lay. 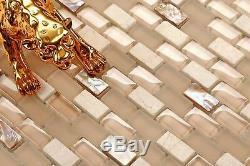 These mosaic tiles can be bought as a small sample in a seperate listing in our shop. 1 sheet is 30cm x 30cm. 11 sheets make up one square meterand is the unit of measure for this listing. Tile pieces are approx: 15mm x 30mm brick shape tiles. 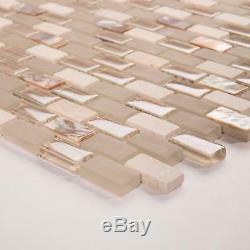 The item "1 SQ M Mother of Pearl, Stone & Glass Mosaic Wall Tile Sheet 0147" is in sale since Monday, September 10, 2018. This item is in the category "Home, Furniture & DIY\DIY Materials\Flooring & Tiles\Floor & Wall Tiles". The seller is "gt-rhein" and is located in Aberdare. This item can be shipped worldwide.